Adelaide radio said goodbye to SA-FM this week, with a new station emerging at 107.1FM next Monday. 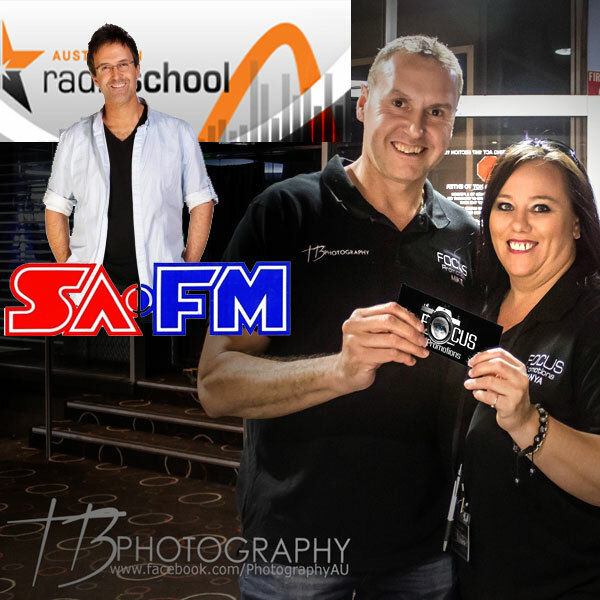 Tonight we talk to one of its popular announcers from the 1990s, Sean Craig Murphy, who currently hosts the number 1 drive time show in Adelaide over at Mix 102.3, about his days back in the iconic walls of SAFM. That’s Sean, top left in the picture, above one of the early SAFM logos. We also discover that two South Aussies with a deep love for original music, are spearheading a new, Thursday night venture to give local bands the spotlight. Tanya Begg and Mike Trandafil from Focus Promotions want all of us to try to get out once a month to catch some live, original music, especially if it’s at Northern Exposure, every Thursday night at the Bridgeway Hotel. That’s Tanya and Mike on the right of the picture. Thanks to Ben from Melbourne Street Fine Wine Cellars, we bring in guest tasters, Greg and Nicole Symonds from Port Lincoln, to sample some delicious, Bovalina Olives. These olives rightfully scooped the prizes at the recent Royal Adelaide Show. The late, Dr Bob Such, is entered into the South Australian Register, for his career as politician who baulked at the party politics and focused on his electorate, sometimes at great cost. Susan tests the boys’ news sense in Is It News, with headlines from 1931. Our wine is from Langhorne Creek and our music gives us a solid dose of Love Cream. Lip smacking goodness! Please share this episode with any South Australians you know, and leave a rating for us in iTunes or your favourite podcast directory. Thank you. 00:01:08 Theme Theme and introduction. Our original theme song in full is here, Adelaidey-hoo. 00:03:17 South Australian Drink Of The Week Bremerton 2010 Walter’s Reserve Cabernet from Langhorne Creek. Tasting notes. 00:05:31 Olive tasting Ben from Melbourne Street Fine Wine Cellars, also gave us some Bovalina Olives when we recorded a show at his shop last month. So, this week, my guest tasters, Nicole and Greg Symonds from Port Lincoln, share their thoughts on these award-winning, South Australian olives. Steve: National Railway Museum, Port Adelaide. Susan: Di Taylor from WOW FM Friday afternoons, The Cool Room. Steve: Thanks to Todd Burgess for tweeting an awesome image of South Australia from the International Space Station – I’ve embedded it at the bottom of the page. Sean is the no. 1 rating announcer in Adelaide’s afternoon timeslot on Mix 102.3 but earlier in his career he was one of the SAFM crew. That station ends its life this week and is starting again next week with a new format and call sign. We chat to Sean about his memories of the heady days of SAFM, Adelaide’s healthy music scene, and his thoughts on the future of podcasting, from his perspective as owner of the Australian Radio School. Steve: Burqa discussion. Tiser had article that the Ban The Burqa debate is prompting positive conversations and acceptance. Bob Such spent 25 years in state parliament and is one of the few politicians known for focusing on his electorate (Fisher) rather than getting caught up in factional fighting.He spent 11 years as a Liberal MP and 14 as an independent.This beautiful piece of writing in In Daily captures the essence of the man. Focus Promotions founders Tanya Begg & Mike Trandafil are all about bring back the live original music scene to Adelaide, Thursday nights at the Bridgeway Hotel, in the hope of discovering the next AC/DC, Angels, Divinyls, Cold Chisel, Rose Tattoo or Screaming Jets so we can all say we saw them “before they were big”. Find out more at the Focus Promotions Facebook Page.